This is part 2 of a series on Kubernetes a la minikube. Minikube is (probably) the easiest way of installing a small Kubernetes system including a graphical user interface. In part 1 we have shown how to install such a system on a fresh CentOS Linux system. In this part, we will create our first Hello World Kubernetes Service accessible from the Internet. For that, we will create a kubernetes deployment, which automatically creates a POD with a single Docker container. Then, we create a Kubernetes Service of type NodePort, which is accessible from the outside world. 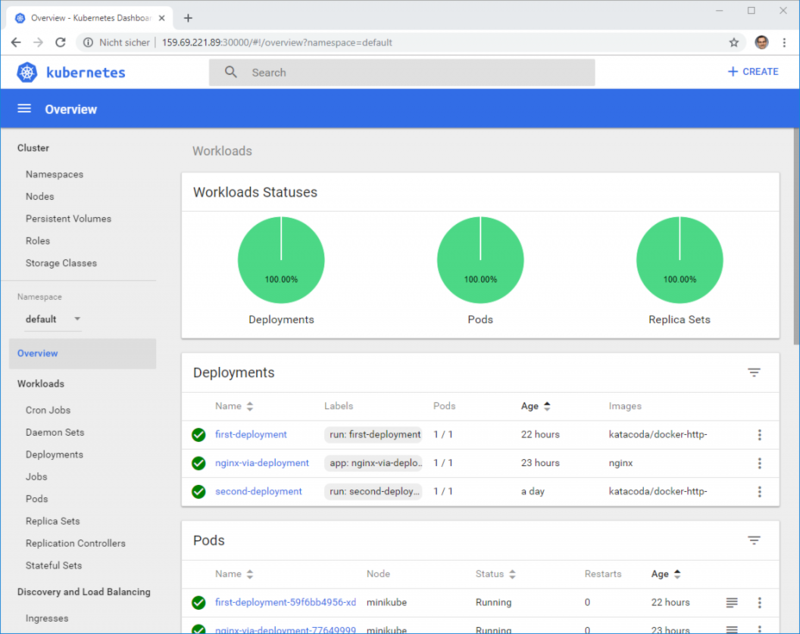 In the appendix, we will show, how to tweak the automatically generated kubernetes dashboard service, so we can reach it from the Internet. 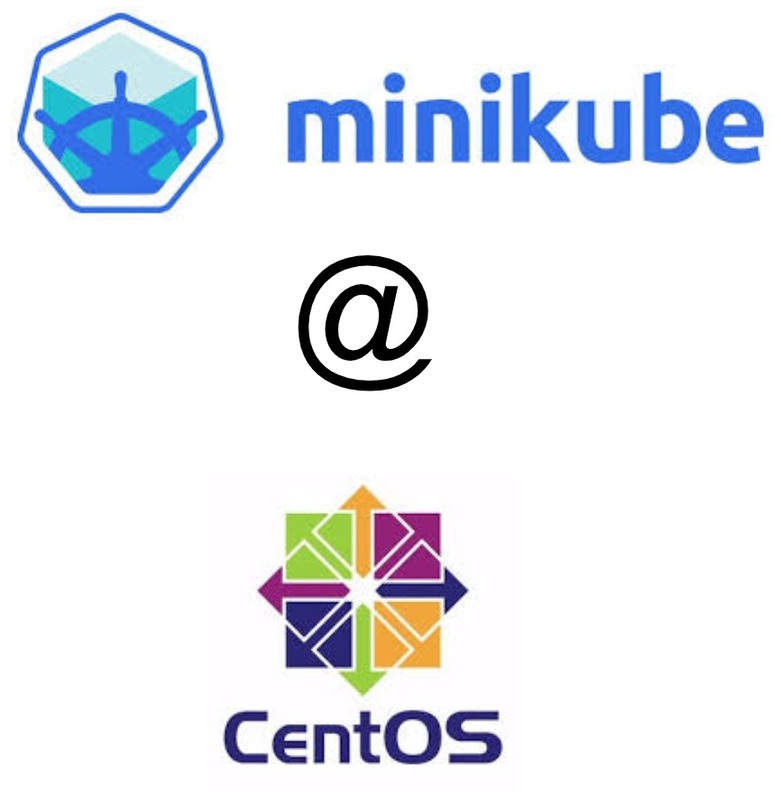 Within this blog post, we will work on minikube installed on a fresh CentOS cloud system we have installed in part 1 of this series. One way of achieving this step is to follow steps 1 to 4 of part 1 of this series. However, there are other possibilities to get access to Kubernetes systems as well. For example, you may want to access a Minishift installation as provided by Ben Hall on his Katacoda platform. Check out e.g. the tutorial “Launch A Single Node Cluster“. Note that it is not possible to create a POD with a kubectl create pod command (crossed out for not confusing the quick reader). Above, we had to create it by reading in a YAML file instead. In that sense, the POD we have created directly seems to be durable, even though the discussions below may hint into another direction: they say that only a deployment will restart a POD if it fails. Since we only have a single node cluster, we cannot test, whether a POD is created on another node, if a node fails. What is a kubernetes deployment? Google: A Deployment runs multiple replicas of your application and automatically replaces any instances that fail or become unresponsive. In this way, Deployments help ensure that one or more instances of your application are available to serve user requests. 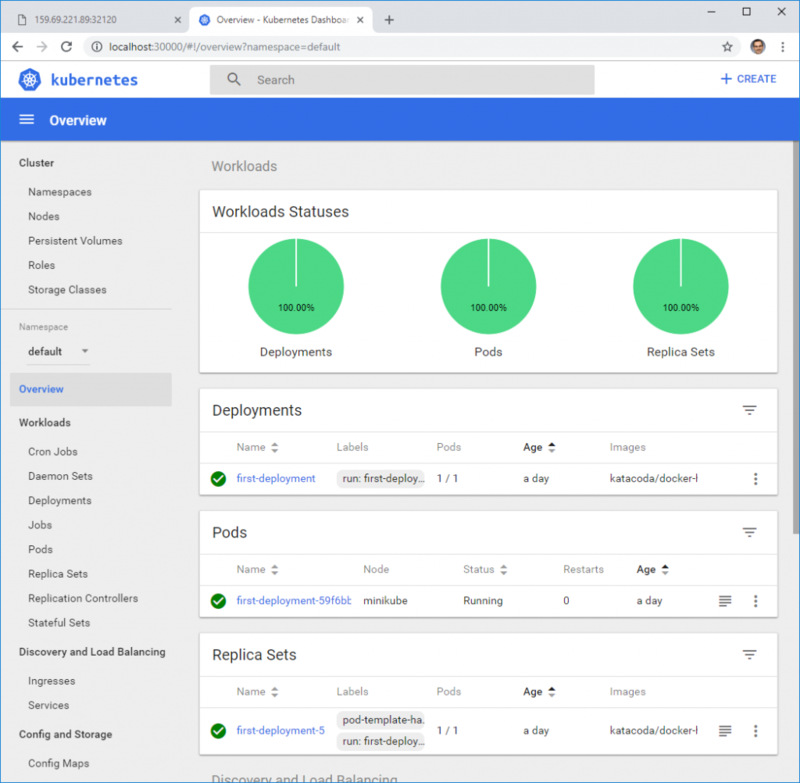 Deployments are managed by the Kubernetes Deployment controller. Okay, when we create a deployment and tell the deployment to create 5 replicas of a POD, this is different from just creating 5 replicas of a POD, because a deployment will restart PODs that have failed. Let us test this. The reason for the depreciation is discussed in this StackOverflow Q&A. # docker ps | grep "^CONTAINER\|deployment"
This is quite similar to what is created with the ‘oc new-app’ command on an OpenShift installation. See e.g. our blog post Getting started with OpenShift. But not quite: here, the service has not yet been created, as can be seen below. Here, we can see, that minikube has started a kubernetes dashboard and a DNS server in the kube-system namespace. Note, however, that the POD IP address 172.17.0.6 is a private address that is not accessible from the outside world. In the next step, we will make sure that the service can be reached from the Internet as well. means of configuring cloud load balancers by way of labels See e.g. https://kubernetes.io/docs/concepts/services-networking/service/ for details on Kubernetes Load Balancer interaction. The ClusterIP way is the default, but it is reachable from within the kubernetes network only. On the other hand, the LoadBalancer option works only in certain cloud environments. Therefore, we choose to expose the service via NodePort. This way, we can make the service reachable from the Internet and still need no external load balancers. Let us now demonstrate the NodePorts ways of exposing a service. Okay, the random port is not nice. On the other hand, we cannot run all containers on the same well-known ports like port 80 (HTTP) or port 443 (HTTPS) by specifying the same target ports on the expose commands. This issue is something that can only be resolved with the help of a reverse proxy or an HTTP load balancer, which is out of scope for this blog post. In this blog post, we have learned how to create, run, and access applications in a Kubernetes environment. For that, we have created Kubernetes PODs, Deployments and Services. 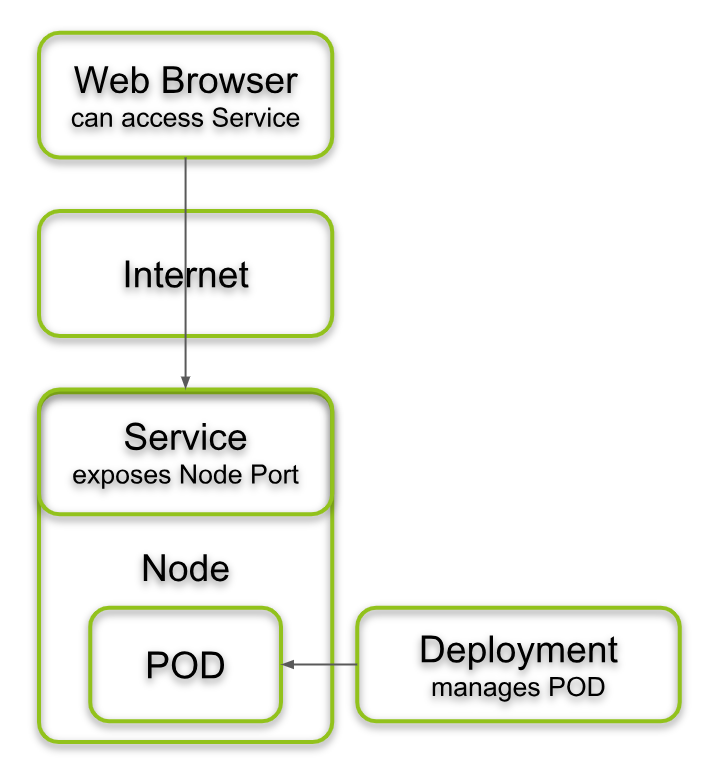 We have learned that Deployments help with the management of PODs. E.g. they restart PODs if they fail. In part 1 of this series, we have accessed the Kubernetes Dashboard via an SSH tunnel. From a security perspective, this is a good solution, since you do not want the Internet to get access to your Kubernetes cluster. However, for learning purposes, it is a good exercise to modify the kubernetes-dashboard service in a way that it is exposed to the Internet as well. As pointed out in part 1 of this series, services of type ClusterIP are reachable Kubernetes-Cluster internal only. We just had tricked us a way into the cluster by creating an SSH tunnel to a cluster node.